We set off from Lancaster House to the farm in Skipton where we met Andrew, the farmer, and Chris and Steph from Stephenson’s Dairy. Andrews’s farm is one of only three in the whole of the UK that is committed to having a free range dairy herd. This means that the whole herd is pastured for a minimum of 181 days and nights. The cows will only come inside when the weather is really bad and during the winter months. Adhering to strict farming practice guidelines means that Andrew can proudly display his ‘pasture promise’ logo. The cows are curious, but not so brave – safety in numbers seems to be the bovine way. We were in the field with Andrew’s herd of approx. 190 cows, so having 2 or 3 creep up behind you for a sneak peak can be a bit unnerving. There were a couple who were brave enough to give us a lick and check us out. I noticed that each cow had a colour on the top of her tail – the farmer told me that this is a quick way to identify which cows are pregnant. Did you know that cows are also pregnant for 9 months? Running alongside the field is a natural stream that is fed from the Yorkshire moors. The cows can potter on down for a drink or a cool off whenever they fancy. The milking shed is a far cry from a stall with a bucket and stool. This is milking at is most advanced. Each cow has a computer chip necklace which is monitored as the cow goes into the milking shed. This is able to give the farmer valuable information about the quantity of milk, and potentially the health of each animal. If a cow were ill and her milk production dropped slightly, the farmer may not otherwise have known that the cow was ill until much later. This means that the vetinary care for these cows can be much more responsive. The milk is stored in a separate area until the wagon comes to take it to be pasturised. It was here that we were intrigued to see a colourful circular chart representing the herd. Each block in the circle represents a cow, and each side of the block is painted a different colour with the cow’s unique number on it. The blocks get turned to the different colours indicating if the cow is pregnant, if she is in her dry stage, when she will be due to calf and so on. Andrew let us visit the ‘Maternity Ward’ to see the 'babies', I did try to persuade Gary that we could fit one in the car but he was having none of it! The herd are Holstein Friesians and are traditionally named after their mothers as this is the best way to follow the pedigree. In the herd that we visited there were quite a few ‘Honeys’. So where does the milk go once it’s been collected? 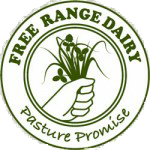 Stephensons have collaborated with Dales Dairy to develop a clearly segregated production process for Free Range milk. This means that they can now offer is fully traceable milk of consistently high quality that puts money directly back in to the local economy. When the milk arrives at Stephenson’s in Morecambe, the final part of the journey is to Lancaster House, and to The Midland Hotel, all in plenty of time for our guests’ breakfast.